I can’t claim to be an expert on pizza, though if I do say so myself I do cook up a mean one when I’m in the mood. Faced with a four hour trek round Manchester’s Christmas markets on a busy Sunday afternoon with three partisan PizzaExpress teenagers it was with some relief that I was able to convince the posse that there might be a better pizza gaff out there. Thankfully I was proven correct. 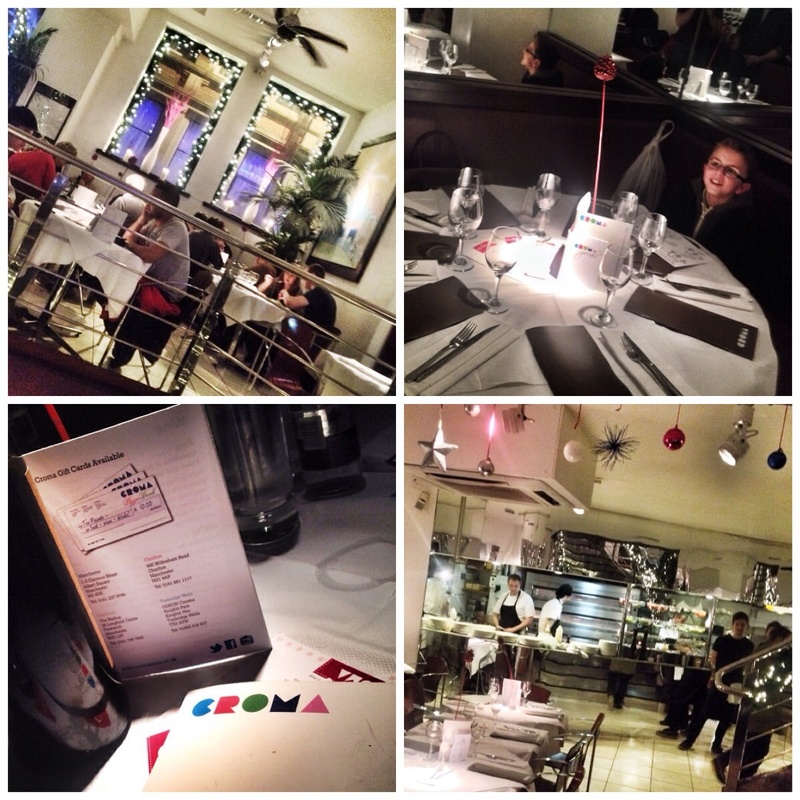 Croma has been in Manchester a few years now and I have been there a few times. It is set up a side street, a stones throw away from the big Santa on Alberts Square. It’s smart enough outside, neat, neon, purple signs lighting up an understated facade. A tranche of steps lead in. Inside chrome (get it!) dominates along with smart lighting and foliage. Our 5pm appointment meant we swept passed the queues downstairs to our smart banquette booth that sat our scheme of seven in great comfort and style. The place was buzzing but that didn’t stop us quickly getting underway with our drinks and menus. We all had starters and all very nice too. The youngsters had dough balls and garlic bread. Thomas, the ten year old, decided to stick with the great little children’s menu. The terrible twins Annabel and Bethany, each thirteen were too grown up! Annabel declared her margarita pizza to be ‘serious pizza’. Bethany (a fussy eater) was foaming at the mouth with the garlic bread. Croma was clearly getting the kids vote. The flame and I along with the big Rodgers’ went for grown up gourmet stuff. For starters I had the Melanzana Parmigiana (£4.95) which was slices of roasted aubergine baked with buffalo mozzarella, provolone cheese, parmesan, tomatoes, garlic and pine kernels, served with olive bread. It was a great start, cheesy, gooey and full of flavour. I then learned lots of the produce is local and that the wonderful olive bread was from Chorlton! How’s about that then? The flame went for the Tuna & Black Olive Pate (£4.85) again served with great bread. Croma is essentially a pizzeria so that’s what I had! They have an amazing selection. They have the classics of course, but really shine on the unusual combinations. I’ve no doubt the Naples originator of the tricolour pizza would be tutting but my Aglefino pizza (£7.95) which consisted of naturally smoked haddock, leeks, a free range egg, emmenthal cheese, chopped parsley, lemon juice and creme fraiche was sensational. 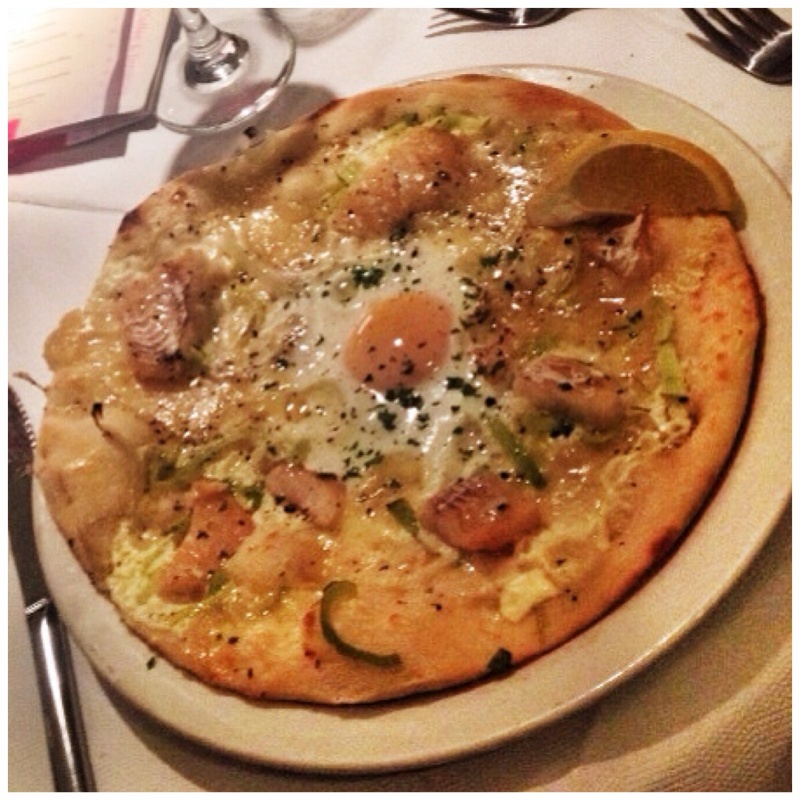 Great, well cooked, thin crust base with a succulent, salty, fishy topping. It didn’t have tomato in the topping but was still great. Other toppings included Peking duck and Indian chicken. You could basically have anything you want, there was even some Christmas options on the specials. I was stuck for choice. A great surprise was the tremendous desert selection. I am a sucker for sherry trifle and have to say it was one of the best I’ve ever had. 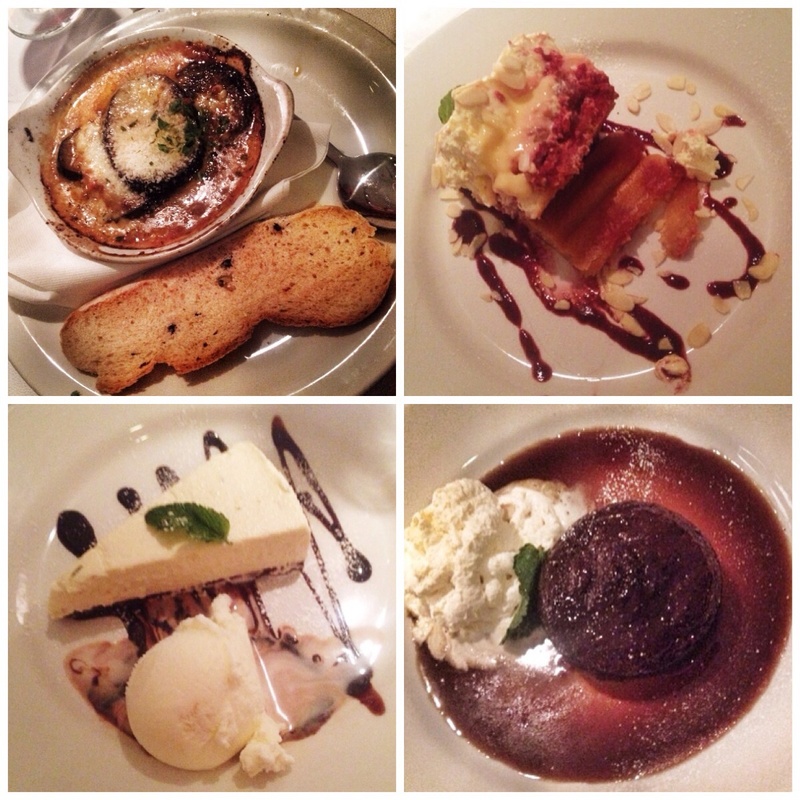 The key lime pie and Cartmel sticky toffee pudding were close behind. One of the troop expressed mild concern that there was no cheesecake, but you can’t have everything! The bill came to £148 including service, wine and drinks for seven. The service was attentive and pleasant. The atmosphere completely electric. Our table was dimly lit with crisp white linen and mirrored walls ensuring we were all able to get on and chat. It was a great meal out and was given the big fat thumbs up by the hard to please twineratti. 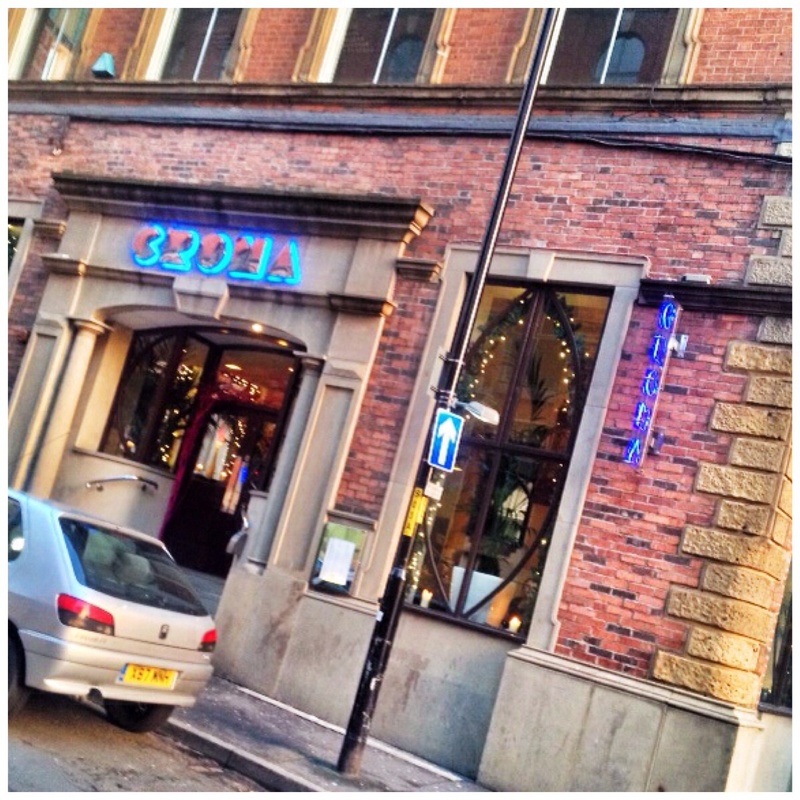 Croma has sprouted out a bit from its Manchester base. It has other local births in Chorlton and Prestwich. It has even gone out to Edinburgh, Loughborough and Tunbridge Wells. I’d definitely look them up!